Armenian Chess Federation under the auspices of the European Chess Union. 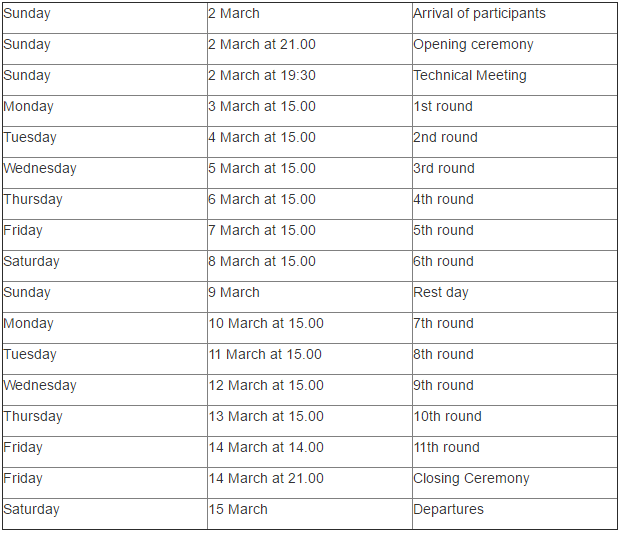 The Championship will be held in Yerevan, Armenia from March 02 (day of arrival) until March 15 (day of departure). The tournament will be held at Elite Plaza Business Centre. The European Individual Chess Championship is open to all players representing Chess Federations which comprise the European Chess Union (FIDE zones 1.1 to 1.10) regardless of their title or rating. There is also no limit in the number of participants per federation; however applications have to be sent by the national federations only. The championship will be organized in 11-round Swiss system in accordance with the ECU Tournament Rules and FIDE Laws of Chess. The rate of play will be 90 minutes for 40 moves plus 30 minutes for the rest of the game with an increment of 30 seconds per move, starting from move one. The ECU Rule related to dress code – Chapter B Article 13 – will be applied at this competition. Chief Arbiter – IA Ashot Vardapetyan (Armenia). Chairman – GM Smbat Lputian (Armenia), Members – GM Giorgi Giorgadze (Georgia), IA Gennadij Nesis (Russia). Protests against the decisions of the Chief Arbiter must be submitted in written form to the Chairman of the appeals committee within one hour after completion of the playing session. The appeal has to be lodged by the player. The decisions of the Appeals Committee are final. Entry form, sent by the organizers, should be filled in and resent to the e-mail or fax of the Armenian Chess Federation not later than January 30, only by the national federations. This date is the registration deadline. After that, federations will not be able to register or modify any registrations. In accordance with the ECU regulations, GM, IM, FM (as well as WGM, WIM, WFM) are required to pay a fee in the amount of 65 €/person, while other players are obliged to make the payment of 130 €/person for the fee. According to the ECU regulations (Art. B.9.5.1), the entry fee shall be paid by the federations to the ECU before or at the start of the competition. 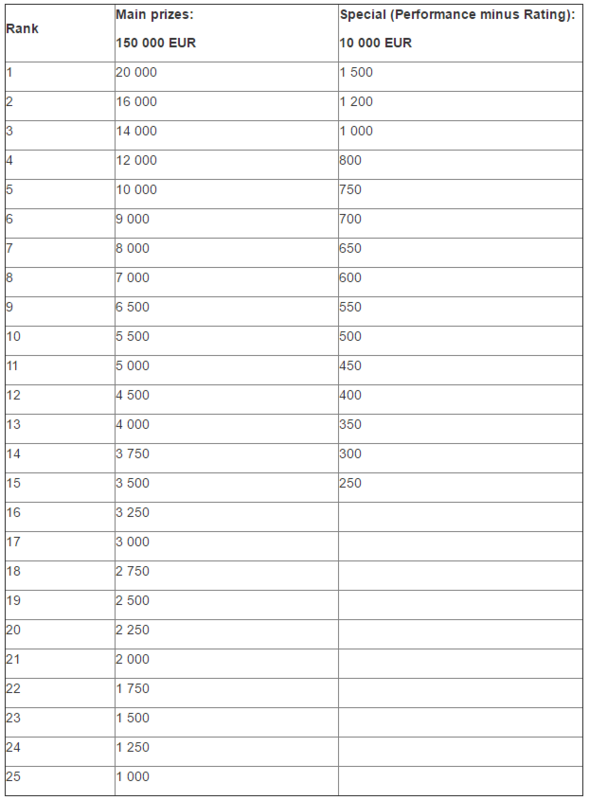 If the entry fee is not paid until the end of round 2, these participants will not be paired in subsequent rounds. All organization fees have to be paid before the deadline for registration – January 30, 2014. Please contact the organizer for all additional information about the hotels. Reservations for accommodation will be confirmed only after all costs are paid to the bank account of Armenian Chess Federation. Austria, Azerbaijan, Belarus, Belgium, Bulgaria, Croatia, Cyprus, Czech Republic, Denmark, Estonia, Finland, France, Germany, Georgia, UK, Greece, Hungary, Iceland, Ireland, Italy, Latvia, Liechtenstein, Lithuania, Luxembourg, Malta, Moldova, Netherlands, Norway, Poland, Portugal, Romania, Russia, Slovakia, Slovenia, Spain, Sweden, Switzerland, Ukraine. Citizens of other European countries can get Armenian entry visa upon their arrival at Yerevan airport. Flashes may be used only in the first ten minutes of each round. Only players and arbiters shall be allowed to enter the actual playing area, except with the expressed permission of the Chief Arbiter. Players are not allowed to enter the closed area of the top boards if they don’t play there themselves. As long as the game is in progress, a player may talk only to an arbiter or with his opponent as permitted by the Laws of Chess. In case of pre-arranged results the Chief Arbiter can decide that the result of the respective game is 0 – 0. During the rounds there will be Medical Services according to the FIDE Tournament Regulations. Tournament Director – GM Smbat Lputian.